A milestone in our journey has recently been reached. 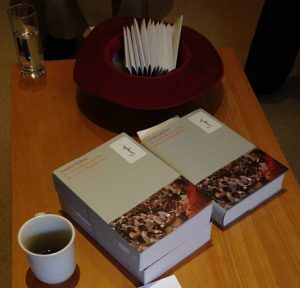 The first published volume of the Complete Works was launched on time in October. Volume 9, Dr Ambedkar and the Revival of Buddhism I, was ready for the celebrations around the anniversary of Dr Ambedkar’s (and hundreds of thousands of his followers’) conversion to Buddhism. In addition to the high quality of the book, the beautiful cover design by Dhammarati (one of the Fellowship) was well-received and sets the precedent for the next twenty-six volumes. So who are the other members of the Fellowship of the Book? Co-editors Vidyadevi and Kalyanaprabha, copyeditor Shantavira, and graphic designer and typesetter Ruth Rudd journeyed from various parts of England to join the Windhorse Publications team (Publishing Director Priyananda, Publishing Controller Michelle and Marketing Coordinator Giulietta) in Cambridge. 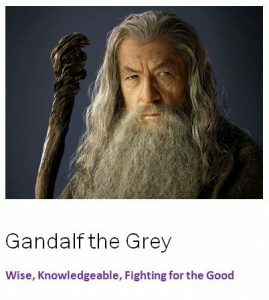 We spoke about inspiration and challenges on this quest, in addition to sharing how we related to The Lord of the Rings character we drew in an icebreaker. Shantavira drew Aragorn, whom we meet in Lord of the Rings as the character Strider, who is veiled in the shadowy corner of an Inn. Shantavira also works in the shadows, digging up meanings to obscure Pali words and applying his depth of knowledge in a relatively unseen background role. Like Aragorn, he cannot help but be revealed as one of the key people who enable the Complete Works to be the most accurate it can be. Vidyadevi (who drew Merry, but is really Galadriel) spoke about the challenge of feeling overwhelmed, when she realizes that a book which is ‘a twinkle in her eye’ needs to be in production in a few months. With (a Merry-like?) humour, she pointed out that if all Sangharakshita’s material was used, the Complete Works could easily be doubled in size, to over fifty volumes rather than twenty-seven! So, whereas all his published writings and most of his edited lectures are being used, we will have only a selection of edited seminar material in the Complete Works. Currently, Vidyadevi is working on two volumes of commentary by Sangharakshita on some of the Songs of Milarepa, which will come out in April, 2018, in time for celebrations around the 50th anniversary of the Triratna Buddhist Order. These Songs of Milarepa will contain the currently published The Yogi’s Joy, along with lots of material on the relationship between Milarepa and Rechungpa, and focusing on the theme of discipleship. This material hasn’t existed in book form before. She is focusing on adding in notes and references, to help show the authenticity of the writing, delving back into ancient texts to find original sources. Kalyanaprabha (Frodo) is working on the volume 1 of The Complete Works, which contains A Survey of Buddhism and The Buddha’s Noble Eightfold Path, along with a Q&A section. She related to Frodo’s determination to see through to the end of the quest, when all the volumes are completed. Her heart is very much in her current editing job. A Survey of Buddhism was a pivotal book for her, as it was one of the first Buddhist books she ever read. ‘Something vast was communicated,’ she remarked. ‘It is a magnum opus of 1957 with huge spiritual import and impact.’ Subhuti is writing a foreword for this one. Meanwhile, back in the office, Michelle is one of the main ringleaders of the quest. Juggling production schedules with last minute additions and changes, she enables communication between editors, proofreaders and designers. From the proper way to index the volumes to which shade of red to use on the cover design, many different aspects of the book’s production cross her desk. One might think she’d love to have Gandalf’s staff, but in the end she drew Gimli and, indeed, thinks his quick-action comes in handy. Priyananda (Elrond) uses his long-vision of the next five years to best understand how to juggle the production of the Complete Works to coincide with events within Triratna, and other new books coming out from Windhorse Publications. Once the research, editing and other painstaking work is done to the text of the volumes, Ruth (Samwise Gamgee) and Giulietta (Gandalf) are pleased to come in. Ruth, like Sam, feels she had ‘gone along for the ride’ as a freelance designer, and ended up with a far greater role than she had imagined – a crucial player in bringing the meaningful volumes of the Buddha’s teachings to light. Giulietta, like Gandalf, is the one who spreads the message of ‘what’s happening’. Gandalf flits here and there on speedy Shadowfax, gathering information and supporting the good where he can. Similarly, Giulietta does her best to reach out to readers in different corners of the world in order to answer their questions and get the word out about the volumes. Finally, the ninth member of the fellowship, Akasapriya, in the last year has been hard at work creating our new website, both ‘front’ and ‘back’, and has magically enabled us to deliver the new sales platform for all books, but particularly for subscriptions to the Complete Works. Accordingly, we have awarded him the Fellowship role of Legolas, our perceptive and loyal friend. The take-home message from our meeting on Friday was that together, we’ll get there. Especially as Cambridge Buddhist Centre kindly opens up one of its study rooms to us, and provides us with tea.